The November Greater Atlanta Coin Show visitors enjoyed a nice but overcast day outside and a busy bourse inside filled with dealers and their displays of numismatics and collectibles. We appreciate all the people that helped make the coin show a busy place to be - from our visitors to our dealers to our security and to the hotel's staff. Thank you one and all for your contributions to the show. As an aside, we offer commiseration to the hotel's crew. The hotel hosted a wedding party in the ballroom the evening before that did not end until 4:30 in the morning. The crew had to breakdown the room, clean it and perform the set-up for our event in just a handful of hours. And, kudos to them, they did a great job. As is usual, the hotel also hosted a couple of churches on Sunday. We welcomed several of the church-goers who stopped by the show. Just briefly, let's touch on a big non-numismatic, non-collectible topic heard frequently on the bourse. That's the election, of course. If your candidate won, lost or didn't even place (no electoral votes), the result certainly means the actions in the nation's capital will be different over the next four years. Regardless, the new president will do some things we like, some we don't and even some that are just strange and need clarification. Just like all the previous presidents. This month, let's take a look at some errors, some unintentional and one definitely on purpose. The first coin is a 2009 Native American dollar coin. In 2009, the coin previously known as the Sacagawea dollar became the Native American dollar to memorialize the heritage of the Indian nations. Each year, a new reverse design highlights an important legacy. The first design emphasized their agricultural knowledge with the Three Sisters design. The Three Sisters referred to the benefits of planting squash, beans and corn together. The bean plant pulls nitrogen from the air, the corn plant provides support for the bean vine and the squash plant provides shade to hold moisture for the plants' roots. The term "three sisters" for that type of farming is attributed to the Iroquois, however several different tribal nations used the method of planting corn, beans and squash together. The legislation introducing the Native American coinage also specified that the date, mint mark and "E Pluribus Unum" be incused on the edge of the coin rather than on the obverse or reverse. That specification leads us to the first error. The obverse and reverse of this dollar coin looks like any of its "normal" counterparts. 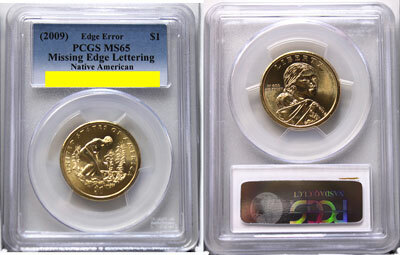 However, this 2009 Three Sisters Native American dollar coin does not have any edge lettering. 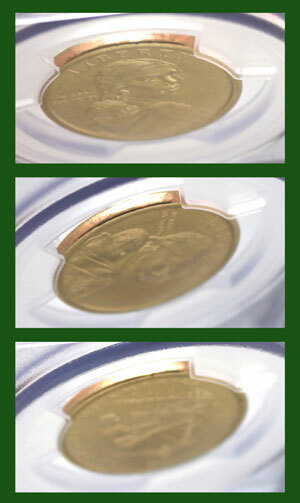 The PCGS holder uses three "fingers" to hold the coin and to allow the smooth edge to show without its inscriptions. The US Mint produced just over 77 million of the Three Sisters Native American dollar coins including the Philadelphia and Denver circulating coins and the San Francisco proof coins. Per PCGS, the population of the MS-65 Missing Edge Lettering is 1,383 and the total population including those of MS-63 through MS-68 shows currently at 4,624. Doing a little math, that puts the total population of Missing Edge Lettering 2009 Native American Dollar at 0.006% of all the minted Three Sisters coins. Next on our error list is another mint error, however this time it's not a coin. Rather it is the certificate. Oddly, the error certificates included the correct metal content and weights for the five silver quarters, but it was the Roosevelt dime and Kennedy half dollar coins with the wrong information. The metal content and the weight for each coin reflected that of the clad coins. The true value is what an error collector is willing to pay. 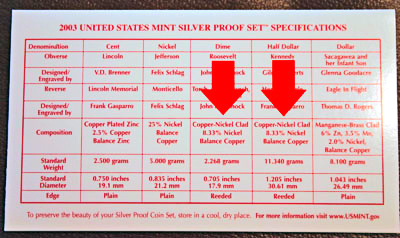 Back in 2003, the US Mint produced red pack silver proof sets with red printed certificates of authenticity. But, probably due to some hasty copy/paste from the file for the clad proof set certificate to the file for the silver proof set certificate, a couple of errors occurred. Someone caught the error during the distribution process. The US Mint mailed a letter of explanation and apology with corrected certificates enclosed to those who had already received their silver proof sets. However, the incorrect certificates of authenticity can still be found in 2003 silver proof sets. Unlike an error coin, generally an error certificate does not add or subtract value from the associated coins, but for some collectors it does pique their interest. Last on our list for this month is an intentional error coin. So, what is an intentional error? It's someone's intention to defraud and profit illegally, otherwise known as a fake. 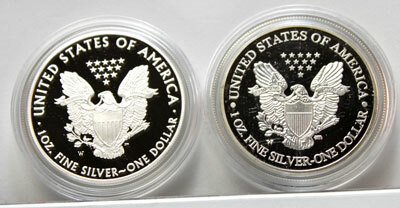 This particular fake coin is a 2010 Silver American Eagle dollar coin. Looking at the packaging, whoever produced the fake coin made sure the packaging included legitimate US Mint materials. 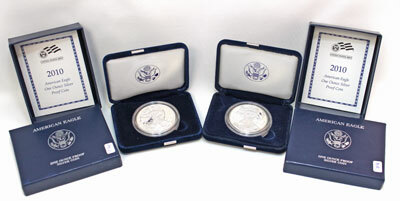 The box, clam shell, certificate of authenticity and clear holder are official US Mint Silver American Eagle components. The real components help trick the unsuspecting buyer. 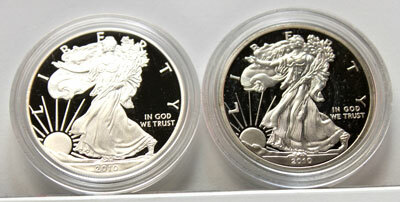 In the picture, the left side reflects a "real" US Mint 2010 Silver American Eagle with the right side showing the fake coin. They appear to be the same US Mint product don't they? Looking at the coins side-by-side, both obverse and reverse, the difference becomes more obvious. On the other hand, someone in a hurry, and not looking at the coins side-by-side, could potentially fall for the fake coins. Oddly, when holding the two coins in your hands, the real coin in one hand and the fake in the other, the fake coin feels lighter. In another observation, the fake coin moves slightly in its holder, shake and it rattles, whereas the real US Mint coin fits perfectly within its plastic holder. Look closely at the comparison pictures to see the precision of the US Mint's artists and process on the left and the lesser quality of the fake on the right. Again, the imposter is good, but with education and attention to the details, the fake can be spotted without a real coin for comparison. If you are in the market for a Silver American Eagle coin, or any coin for that matter, make sure you gain knowledge about the coin and purchase from trusted sources. That's it for the examples for this month. Mark your calendars for the next Greater Atlanta Coin Show on December 11, 2016. The December show will be in the hotel's Hamilton's Restaurant. It is just down the hallway from the ballroom space, between the elevators and the front lobby. The restaurant looks out over the golf course and has a view of Kennesaw mountain in the distance. The dealers of the Greater Atlanta Coin Show will pack the restaurant area with their displays of coins, bullion, currency, other money-related collectibles and some non-numismatic collectibles, too.